In today’s fast-paced and complex information environment, news consumers must make rapid-fire judgments about how to internalize news-related statements – statements that often come in snippets and through pathways that provide little context. A new Pew Research Center survey of 5,035 U.S. adults examines a basic step in that process: whether members of the public can recognize news as factual – something that’s capable of being proved or disproved by objective evidence – or as an opinion that reflects the beliefs and values of whoever expressed it. 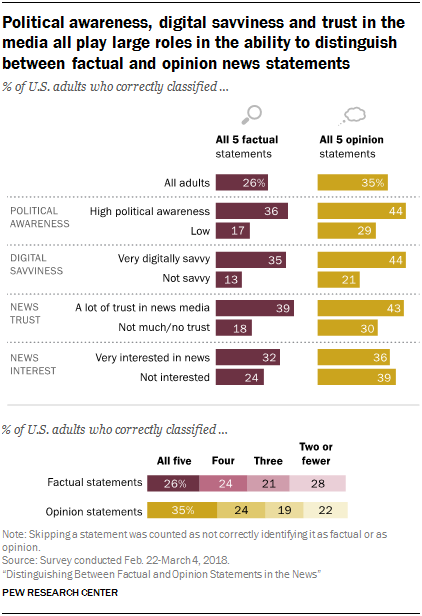 In addition to political awareness, party identification plays a role in how Americans differentiate between factual and opinion news statements. 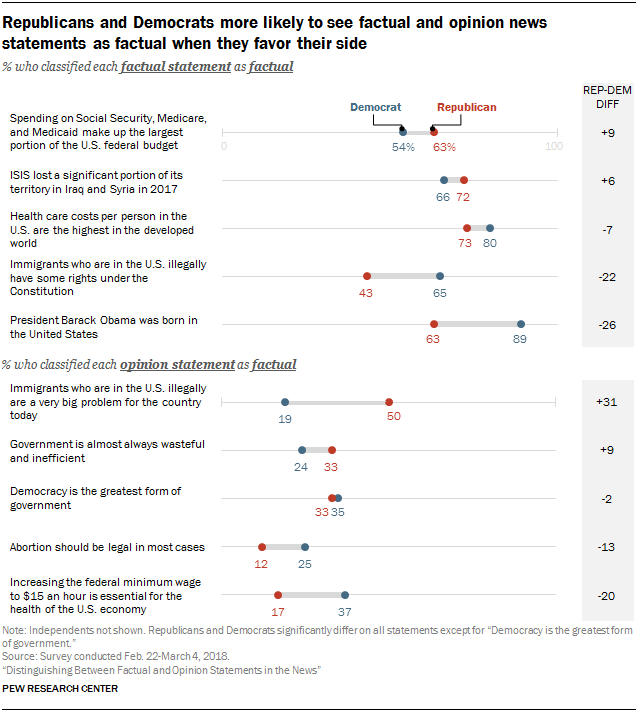 Both Republicans and Democrats show a propensity to be influenced by which side of the aisle a statement appeals to most. For example, members of each political party were more likely to label both factual and opinion statements as factual when they appealed more to their political side. At this point, then, the U.S. is not completely detached from what is factual and what is not. But with the vast majority of Americans getting at least some news online, gaps across population groups in the ability to sort news correctly raise caution. Amid the massive array of content that flows through the digital space hourly, the brief dips into and out of news and the country’s heightened political divisiveness, the ability and motivation to quickly sort news correctly is all the more critical. To accomplish this, respondents were shown a series of news-related statements in the main portion of the study: five factual statements, five opinions and two statements that don’t fit clearly into either the factual or opinion buckets – termed here as “borderline” statements. Respondents were asked to determine if each was a factual statement (whether accurate or not) or an opinion statement (whether agreed with or not). For more information on how statements were selected for the study, see below. In the initial set, five statements were factual, five were opinion and two were in an ambiguous space between factual and opinion – referred to here as “borderline” statements. (All of the factual statements were accurate.) The statements were written and classified in consultation with experts both inside and outside Pew Research Center. The goal was to include an equal number of statements that would more likely appeal to the political right or to the political left, with an overall balance across statements. All of the statements related to policy issues and current events. The individual statements are listed in an expandable box at the end of this section, and the complete methodology, including further information on statement selection, classification, and political appeal, can be found here. Overall, attributing the statements to news outlets had a limited impact on statement classification, except for one case: Republicans were modestly more likely than Democrats to accurately classify the three factual statements in this second set when they were attributed to Fox News – and correspondingly, Democrats were modestly less likely than Republicans to do so. 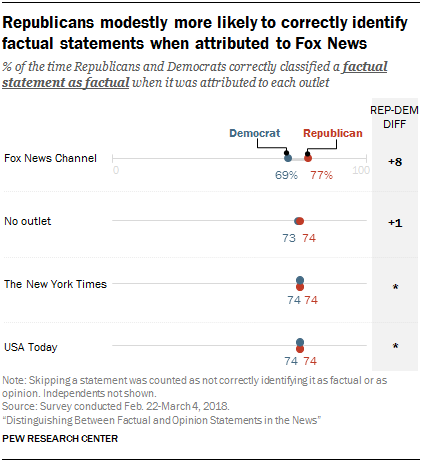 Republicans correctly classified them 77% of the time when attributed to Fox News, 8 percentage points higher than Democrats, who did so 69% of the time.5 Members of the two parties were as likely as each other to correctly classify the factual statements when no source was attributed or when USA Today or The New York Times was attributed. Labeling statements with a news outlet had no impact on how Republicans or Democrats classified the opinion statements. And, overall, the same general findings about differences based on political awareness, digital savviness and trust also held true for this second set of statements. The study probed one step further for the initial set of 12 statements. If respondents identified a statement as factual, they were then asked if they thought it was accurate or inaccurate. If they identified a statement to be an opinion, they were asked whether they agreed or disagreed with it. When Americans incorrectly classified factual statements as opinions, they most often disagreed with the statement. When correctly classifying opinions as such, however, Americans expressed more of a mix of agreeing and disagreeing with the statement. This is Pew Research Center’s first step in understanding how people parse through information as factual or opinion. Creating the mix of statements was a multistep and rigorous process that incorporated a wide variety of viewpoints. First, researchers sifted through a number of different sources to create an initial pool of statements. The factual statements were drawn from sources including news organizations, government agencies, research organizations and fact-checking entities, and were verified by the research team as accurate. The opinion statements were adapted largely from public opinion survey questions. A final list of statements was created in consultation with Pew Research Center subject matter experts and an external board of advisers. In the primary set of statements, respondents saw five factual, five opinion and two borderline statements. Factual statements that lend support to views held by more people on one side of the ideological spectrum (and fewer of those on the other side) were classified as appealing to the narrative of that side. Opinion statements were classified as appealing to one side if in recent surveys they were supported more by one political party than the other. Two of the statements (one factual and one opinion) were “neutral” and intended to appeal equally to the left and right. As noted previously, respondents were first asked to classify each news statement as a factual statement or an opinion statement. Extensive testing of the question wording was conducted to ensure that respondents would not treat this task as asking if they agree with the statement or as a knowledge quiz. This is why, for instance, the question does not merely ask whether the statement is a factual or an opinion statement and instead includes explanatory language as follows: “Regardless of how knowledgeable you are about the topic, would you consider this statement to be a factual statement (whether you think it is accurate or not) OR an opinion statement (whether you agree with it or not)?” For more details on the testing of different question wordings, see Appendix A. After classifying each statement as factual or opinion, respondents were then asked one of two follow-up questions. If they classified a statement as factual, they were then asked if they thought the statement was accurate or inaccurate. If they classified it as an opinion, they were asked if they agreed or disagreed with the statement. Applying additional scrutiny to Muslim Americans would not reduce terrorism in the U.S.